Gluten-Free Pumpkin Cupcakes for Fall Birthdays! With summer leaving and fall beginning we are excited about fall flavored cupcakes! 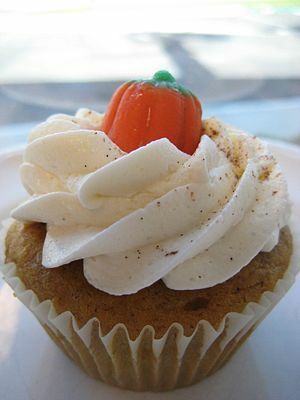 Today we have a recipe for gluten-free pumpkin cupcakes with orange cream cheese frosting—yum! Enjoy these at your next fall birthday bash, or just because it’s fall! Preheat the oven to 350°F. Place an oven rack in the center of the oven. Add the eggs, one by one, mixing well after each addition. Add the vanilla and pumpkin purée. Beat until well mixed. In a separate bowl, whisk together the dry ingredients—the flour, baking soda, baking powder, salt and spices. Add the flour mixture and buttermilk alternately to the pumpkin batter, in three additions, beginning and ending with the flour mixture. Use a wooden spoon to mix in the pecans and raisins. Arrange paper cupcake holders in a muffin tin. Spoon the batter into the cupcake paper cups, filling them close to the top of the cups. Bake about 18 minutes, or until a toothpick inserted in the middle comes out clean. Remove from oven to a rack. Let cool completely before frosting. Beat the cream cheese, butter or margarine, orange peel, and orange juice until creamy. Beat in confectioner’s sugar until blended and smooth. 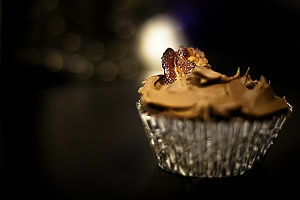 Spread icing on cooled cupcakes and sprinkle with walnuts! Today we have a recipe to share with you that has been adapted from this recipe by Lovestohost on All Recipes. They are simply amazing, because you don’t have to decide between cupcakes and cookies! 1 package of chocolate chip cookie dough – we love organic options you can pick up at Whole Foods! 1 (18.25 ounce) box yellow cake mix – Arrowhead Mills makes a great organic yellow cake mix! Form the cookie dough into tablespoon-sized balls, place onto a baking sheet, and freeze until solid, about 2 hours. You must freeze the cookie dough in order for these to work! Beat 3 eggs in a large bowl with a whisk. Add the cake mix, water, and canola oil; continue beating for 2 minutes until batter is smooth. Fill the cupcake liners 2/3 of the way full. Place a frozen cookie dough ball on the top center of each cupcake. Bake in the preheated oven until a toothpick inserted into the cake portion of the cupcake (not the cookie dough ball) comes clean, which is about 16-18 minutes. It is important not to over bake, otherwise the cookie dough will be overdone. Let the cupcakes cool in the pan for 10 minutes before removing them to cool completely on a wire rack. Frost them with your favorite store-bought or homemade frosting and consider sprinkling them with mini chocolate chips! Chocolate or cream cheese frosting works nicely. This recipe could be changed up with any flavored cookie dough—oatmeal raisin, chocolate chunk, snicker doodle … which is your favorite cookie dough? Looking for a fun and cute way to decorate cupcakes for your next party? Try this idea from Disney’s Family Fun site! Frost the cupcakes in different colors such as green, red, blue, yellow, pink, or orange and arrange the cupcakes on a large platter or table. Tape a length of ribbon to the bottom of each cupcake. To see the original tutorial click here! Last night was an incredible evening. We want to thank everyone who came out to our Annual Event. We could not do what we do without you! We sold 5 Auction Items, gathered over 50 presents, and we still having people calling us to make a donation. We were glad that Michelle Ma and her team from West Valley Community Services could come out and share their heart with us! We said it last night, but it cannot be said enough, West Valley is changing the community of Cupertino. Their food pantry, Job Advice Counselors, Bank assistance, and Housing are transforming the community we live in. We are excited to be a small part of what they do for our community! We couldn’t possibly talk about last night without showing you some the photo’s from the event!